Although small and often unnoticed, threaded fasteners are integral components in millions of products. They’re used for myriad reasons, but their strength benefits are one of the most obvious reasons. They’re much stronger than their non-threaded counterparts. As well, threaded fasteners are reversible, which means they can be taken apart after assembly, so they’re convenient. They’re also cost effective and available in a wide range of sizes, which makes them incredibly versatile. But buying threaded fasteners is no easy task. 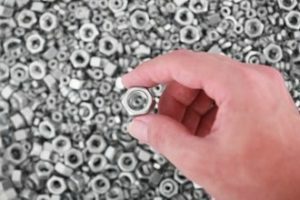 Nuts, bolts, and washers might seem like they’re all the same, but in fact, there are almost unperceivable differences among the different types. These differences are what will make them either perfect, decent, or utterly useless for your specific application. So it’s important to understand them in order to make the correct purchasing decisions. Understanding the different thread types, in particular, can be especially useful if you’re in charge of buying threaded fasteners. Here’s what you need to know. The most common of all of the thread types is the unified national coarse type. UNC threads are commonly used for fasteners because they fit deeper and are more generic than fine threads, which allows for easier removal if needed. UNC threads also boast a higher tolerance during plating and manufacturing, and they do not require cross-threading for assembly. Unified national fine threads have a more specific fit, and thus have finer tension adjustment and tighter tolerances. UNF threads have better torque-locking ability and can carry heavier loads. This type of threaded fastener is commonly used in the aerospace industry. Finer than UNF threads, the united national extra fine threads are used in very specific applications, such as those with tapped holes in thin material, tapped holes in hard material, or thin threaded walls. For most industrial applications, coarse threads are generally better than fine threads. They offer great resistance when it comes to cross-threading and stripping and are thus more durable. Additionally, they’re not as susceptible to being damaged or nicked, so they do not have to be handled with special care like fasteners with fine threads do. And because the head of each thread is greater, the flank engagement is also greater for coarse threads than fine threads. Coarse threads are also faster to install, are not as negatively affected by plating buildup, and do not experience as many assembly, gagging, and galling issues because there is more material between each flank. Although coarse thread types are ideal for many applications, fine threads also do have their benefits. They are stronger in tension and shear than coarse threads due to their minor diameter and larger tensile stress area. Their small helix angle makes them less likely to loosen under vibration conditions and their finer pitch allows for finer adjustments when needed. Moreover, fine threads can be more easily tapped into thin walled sections and difficult-to-tap materials. UNJC and UNJF threads can be either external or internal. The external variations have a larger root radius, which results in a larger tensile area and a smaller stress concentration. These “J” thread types are most commonly used for bolts that are purchased to carry heavy loads. The UNR external thread is similar to a unified national coarse thread; the only difference being that the UNR external thread has a rounded root radius. UNK threads are also similar to UNR threads but the minor diameter and root radius of this thread type requires inspection. Lastly, constant-pitch threads can be created in many different diameters to suit any given application. Typically, bolts with a diameter of 1 inch or above will use pitches of 8, 12, or 16 threads per inch.